On May 9-13, The Amsterdam Go Together 2013 event drew over one hundred go lovers to the capital of the Netherlands. 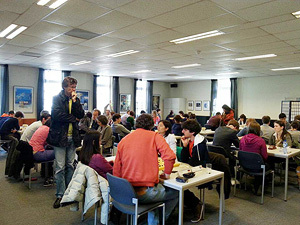 The European Pair Go Championship as well as The International Amsterdam Go Tournament were played as a part of the event. The level of the Pair Go Championship tournament was notably high this year, most of the 24 participating pairs having a dan ranking on average. The favorite pair for the win, the Russian siblings Shikshin and Shikshina, neatly succeeded in claiming the throne. Followed by them at the second place were Klara Zaloudkavova and Jan Hora from the Czech Republic. You can see the full results here. A possible reason for the high number of strong participants was the prizes for the first two places: the winners received a seat for the International Amateur Pair Go Championship, and the runners-up a seat for the 3rd SportAccord World Mind Games.